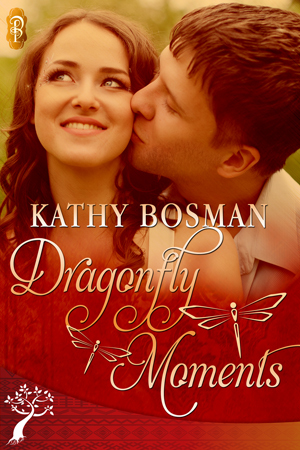 I’m so excited to welcome South African author Kathy Bosman to the blog today – and be sure not to miss her great giveaway at the bottom of the page! Today is my first stop for my first ever proper blog tour. I’m giving away a $10 Amazon voucher and five swag bags for the whole tour. I’m going to be posting a different slant to my book every post so it’s not going to be boring. We’re going to have fun. If you want to enter the giveaway, go to the Rafflecoptertable at the bottom of the page. Dragonfly Moments was published with Decadent Publishing in May this year. The book was first written in 2010 (then called Tessa’s Choice) and was so different to what it is now. By the time it reached publishing stage, I’d learned so much about writing after having worked with editors in my previous books and with the wonderful Decadent editor. I have a sludge pile on my computer of books I wrote but have never published. Of course I never will – shudder, shudder. You could call those my study courses because really every bit of writing is learning. Tessa’s Choice kept on calling me though. I couldn’t ignore the story of a love from long ago coming back into Tessa’s life so I rewrote the book. Tessa had a serious crush on her best friend’s boyfriend when she was just out of school. They had a friendship but nothing more. She loved him so much that she sent him a letter after she moved to college professing her undying love for him. Little does she realise how much that letter opens up feelings Ryan had ignored towards Tessa. He keeps the letter but only contacts her seven years later when she’s opened up her own art gallery in Nelson Mandela Square. Ryan is disappointed to discover that Tessa is already in a serious relationship. He doesn’t know how obsessed she’s become in starting her own family. But her relationship starts to crumble and Ryan helps her with her art and business. He’s just the friend she needs at the moment but can she risk her life dreams to allow her heart to love him again? His voice was resigned, and then he winked at her as if to dispel the tension. It did no such thing. The letter at the back of the sketch had promised she would love him forever, hadn’t it? She had believed she would never love anyone as much as Ryan and that he showed her what true love was. Pushing up her chin to pretend that her heart wasn’t zinging with emotion, she started to walk toward the one wall to adjust a painting. He grabbed her hand. She tried to pull away, but he firmly pulled her close. Heat and energy radiated off him and his manly scent encompassed her. Even his breath was a sweetness she wanted to drink in. She took in the shape of his face, his mouth which drooped slightly to the left, his skewed jaw line and the prominent cheek bones. His eyebrows were dark and perfectly shaped, and he had such long eyelashes. Yanking her burning hand away, she made sure her back was facing him. She faced him, her mouth partially open, devoid of words. He’d loved her? Why didn’t he tell her then before it was too late? His gaze followed her from head to foot, and heat branded her face while a spark ignited her body. She pulled back. For a moment, he had her in a trance. Maybe she should leave Mark and pursue this. Jump right in. No, of course not. Who was Ryan now, anyway? She hardly knew him. He could disappear again. Mark cared for her and he was the perfect match to build a family. That’s all she needed. Dragonfly Moments is available now from Decadent Publishing, Amazon, Amazon UK, ARe, Smashwords, and Barnes & Noble. Kathy loved reading and writing from early childhood, but her dream to write books was put aside until her kids were small, and she had little mental stimulation. The writing became a passion as well as her love for romance. She hasn’t looked back since writing her first romance novel in 2007. She homeschools her three children so in between deciphering algebraic problems for her teenage son (with little success), conducting science experiments, and tackling piles of laundry and dishes, she miraculously finds time to write books and read many others for fun. Connect with Kathy Bosman online at her website, Facebook page or Twitter. This entry was posted in writing and tagged excerpt, guest post, release week, ROSA by Rebecca Crowley. Bookmark the permalink. I have the book sitting on my Kindle waiting to be read, Kathy. I’m looking forward to it.